Autograph album given to Adelia Caroline (Carleton) Talpey of Rockport, Maine, and Boston, Massachusetts, by R. S. Luce, who was possibly Rebecca (Spear) Luce of Rockland, Maine. 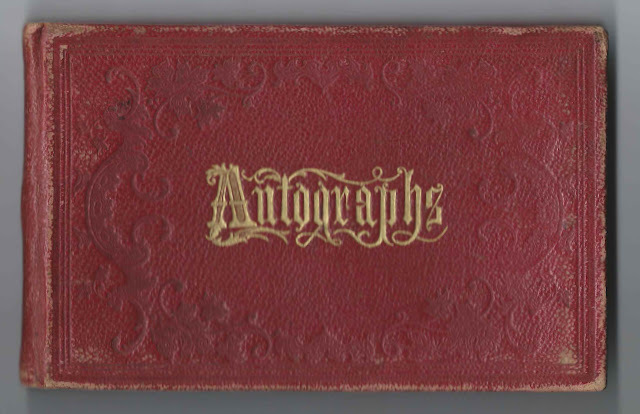 See another post that features a photograph album presented to Capt. Mrs. Talpey, presumably Adelia Caroline (Carleton) Talpey, by D. Richard Johnson, as a memento of Hull, presumably Hull, England. Hull was a port of call for vessels captained by Henry Talpey, and his wife frequently accompanied him on his voyages. 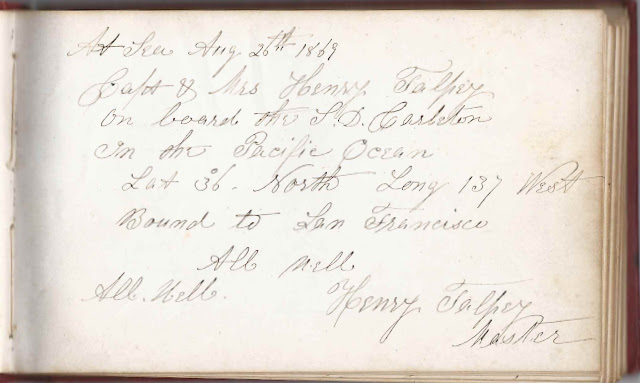 The first dated page in the autograph album was signed by Adelia's husband Henry Talpey on August 26, 1869, while he was the master of the S. D. Carleton, then sailing in the Pacific Ocean at Lat. 36 North, Long. 137 West, bound for San Francisco. "All well. All well." The S. D. Carleton was presumably named for Adelia's father Samuel Dexter Carleton, who probably owned it or at least a part of it. I'm thinking that Adelia was with him on this venture and on future ones, and that is how the autographs came to be collected from locations far and wide. It's also possible that Adelia stayed home, and Henry collected the autographs for her, but it wouldn't have been unusual for wives to accompany their husbands on lengthy voyages, even if they had small children in tow, which Adelia did not. 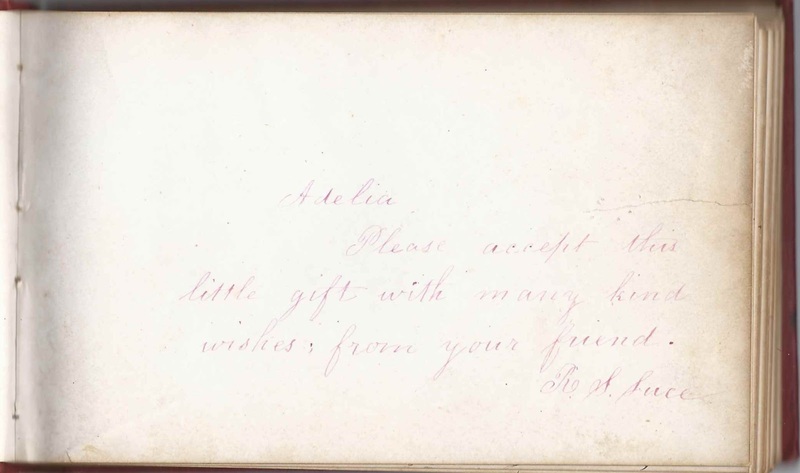 The album is approximately 6-1/2" x 4" and contains the sentiments of 97 of Adelia's relatives and friends. Included among these are many sea captains encountered along the way, including at Liverpool and Shanghai, and residents of Pitcairn Island. An alphabetical list of the signers appears at the end of this post. Adelia Caroline (Carleton) Talpey was born at Rockport, Maine, on 12 June 1841, the daughter of Samuel Dexter Carleton and Caroline T. (Ulmer) Verrill Carleton, who was the widow of William Verrill, with whom she had a daughter Sarah Jane Verrill. Sarah Jane Verrill married Rev. William Henry Washburn, son of Rev. Job Washburn and Sarah Decker (Clough) Washburn. They and their son Dexter Carlton Washburn signed pages in Adelia's album while they were visiting Rockport, Maine, from their home at Lewiston, Maine, on August 22, 1879. Adelia's father, Samuel Dexter Carleton, was involved in shipping and trade and had a hand in the building of 62 vessels, including the Frederick Billings, the largest vessel built to that time and which blew up while being loaded with nitrate at Caleta Buena, Chile. Sadly, after having five children, two of whom died in infancy, with her second husband, Adelia's mother Caroline died on 26 September 1845. Adelia's two surviving full siblings signed pages in her album. 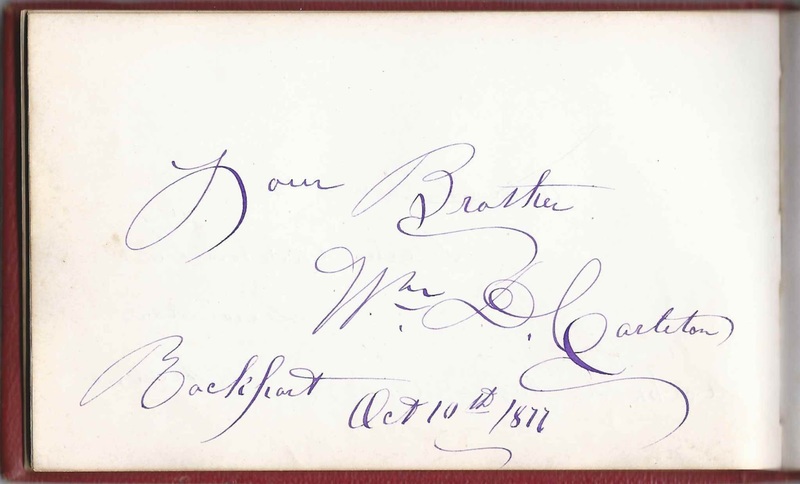 Her brother, William Dexter Carleton, signed a page at Rockport, Maine, on October 10, 1877. 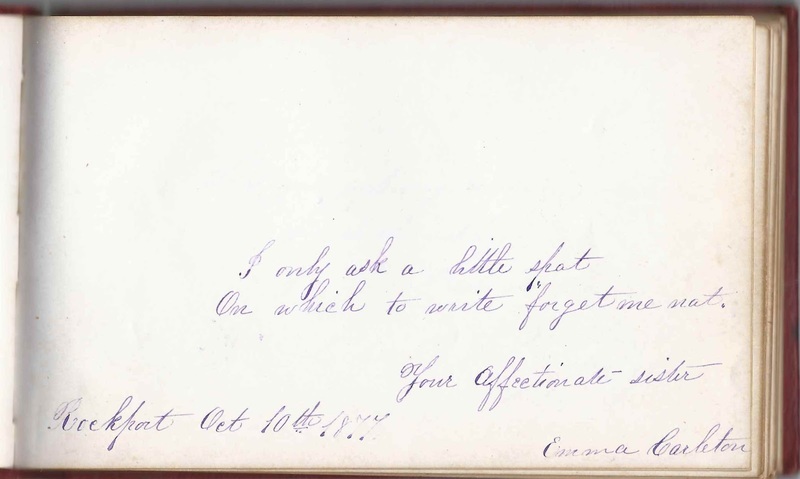 His wife, Emma Carleton signed the facing page on the same date. I found conflicting data online as to Emma's parents. Some trees have her parents as James and Hannah McLane. However, her death record, not always a reliable source, gives her parents as Leonard and Mary (Shaw) Stevens. Adelia's sister Elizabeth Ulmer (Carleton) Luce signed a page at Rockport, Maine, also on October 10, 1877. Her husband was William Henry Luce, son of Andrew Grant Luce and Rebecca (Spear) Luce. It's tempting to think that the R. S. Luce who presented the album to Adelia was Rebecca (Spear) Luce. On 15 July 1847, Adelia's father married Harriet Newell Washburn, daughter of Rev. Job and Sarah Decker (Clough) Washburn. One of Harriet's siblings was Rev. William Henry Washburn, mentioned above as the husband of Adelia's older half-sister Sarah Jane (Verrill) Washburn. There was a Kate Carleton, age 8, listed with Samuel Dexter Carleton and Harriet (Newell) Carleton and Samuel's children William, Adelia and Eliza, in the 1860 Census of Camden, Maine. At first I thought she was the daughter of Samuel and Harriet, but now I think she was their double niece, Katherine Cunningham Carleton, daughter of Samuel's brother, Elbridge Ebenezer Carleton, and Harriet's sister, Isabella Prince (Washburn) Carleton. Perhaps there was sickness or disruption in Kate's home at the time. On 24 November 1868, Adelia Caroline Carleton became the third wife of master mariner Henry Talpey of York, Maine, and Boston, Massachusetts. The ceremony was conducted by Adelia's step grandfather, Rev. Job Washburn, who signed a page in the album at the age of 91. It's possible that Adelia and Henry met because Henry served as captain on one or more of Adelia's father's vessels. In 1877 they were apparently the first to sail the Wandering Jew, built at Camden, Maine in 1877 and owned partly by Adelia's father Samuel Dexter Carleton. The ship was about 219 feet long, with a 40 foot beam, 29 feet deep, and with a weight of 1650 tons. She was scuttled at Hong Kong in 1895 after catching fire. Henry Talpey was born about 1819 at York, Maine, the son of Henry and Abigail (Trafton, I think) Talpey of York, Maine. Several Talpey family members from the York, Maine, area signed pages in the album. Adelia's husband Henry had first been married to Mary Elizabeth Stover, whom he married on 26 March 1846. She was the daughter of David and Betsey (Simpson) Stover of York, Maine. Henry and Mary Elizabeth had at least two children, before Mary Elizabeth (Stover) Talpey died, sometime before December 1858. Alfred Henry Talpey, born 7 January 1852 at York, Maine; he also signed in the album, as did his wife Constance Mary Beatrice (Fryer) Talpey. Their daughter Florence Trafton Talpey married author Ben Ames Williams. On 13 December 1858 at Chelsea, Massachusetts, Henry Talpey married Emily Graham (Mathews) Blanchard, daughter of Samuel and Mary (Treat) Mathews and widow of Benjamin Blanchard, who died at sea. Henry and Emily had a son Harry Blanchard Talpey, who died in infancy in 1860. Emily herself died 12 May 1868 at Chelsea, Massachusetts. The album reflects the trips that the newly married Henry and Adelia Caroline (Carleton) Talpey took in the years after their marriage. I'm not sure if they had any children or not. I looked for them in the 1880 Census, to see if there were any children in their household, but couldn't find them, which isn't surprising, since many autographs from Pitcairn Island were acquired in February 1880. Charles Eugene Cobb of Camden, Maine. Henry and Adelia spent enough time at Pitcairn Island in 1880 to gather the sentiments of thirteen residents with the surnames of Christian, McCoy and Young. Interestingly, one Pitcairn resident, Ernest Heywood Christian, sailed with Henry and Adelia on the Wandering Jew in 1881 and signed a page onboard on April 5, 1881 "far away from home". Read more about Ernest's voyage with the Talpeys on the Wandering Jew here. Ernest was the son of Thursday October Christian II, who also signed the page. Another interesting signer was Liverpool sextant maker William Desilva, who married Nancy Willey of Thomaston, Maine. He signed on June 2, 1870 and gave his address as 114 Duke Street, Liverpool. Henry Talpey and Adelia Caroline (Carleton) Talpey died at Boston, Massachusetts, he in 1900 and she in 1909. Can't decipher the name, perhaps Le Docteur Servais, signed at Hotel de Flandres at Antwerp, Belgium, on 24 December 1877. Page written in French. Not sure whether he was a hotel doctor or a ship doctor. F. C. N., signed on board, on march 29, 1882. Implies that the signer and Adelia were on the "Wandering Jew", the Camden, Maine, built ship that Adelia's father was a part owner of. Aunt Sarah, signed at Thomaston, Maine, on September 11, 1877. Adelia has several aunts named Sarah. One of them, at least, lived at Thomaston, Maine. That was Sarah Eliza (Washburn) Robinson, sister of Adelia's stepmother Harriet Newell Washburn, and wife of Benjamin P. Robinson. Martha A. Adams, signed at Cape Neddick, Maine, on September 2, 1870. Possibly Martha (Talpey) Adams, daughter of Josiah Talpey and wife of Samuel J. Adams. Josiah Talpey was a brother to Adelia's husband Henry Talpey. Mrs. G. W. Andrews of No. 42 Broadway, HongKew [neighborhood in Shanghai], signed at Shanghai, China, on October 10, 1873. Her husband, G. W. Andrews, of the Steamer Fire Queen, signed the right facing page. G. W. Andrews of the Steamer "Fire Queen" at Shanghai, China, signed there on 9 October 1873. His wife signed the left facing page. Adeline Peabody Babb of Rockport, Maine, signed at Chelsea, Massachusetts, on February 19, 1872. She was a sister to Sarah Smith Babb, who married Adelia's father's brother Philander Jackson Carleton. 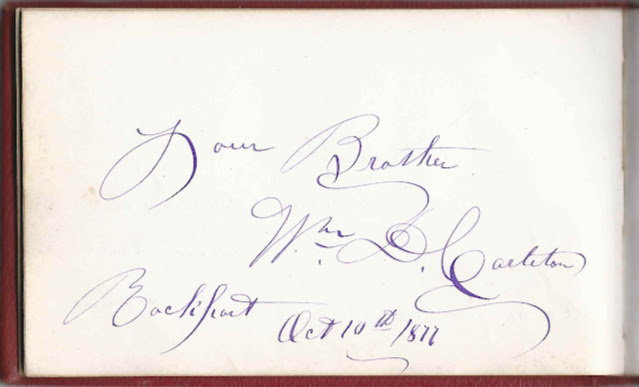 Lu-Lu Brodhead of Baltimore, Maryland, signed at Boston Highlands [Roxbury section], Massachusetts, on November 12, 1879. F. W. Call, signed at Antwerp, Belgium in 1877. Associated with the Ship "Wandering Jew". I believe this is the ship built at Camden, Maine in 1877, about 219 feet long, with a 40 foot beam, 29 feet deep, weight of 1650 tons. One of her owners was Adelia's father Samuel Dexter Carleton. She was scuttled at Hong Kong in 1895 after catching fire. 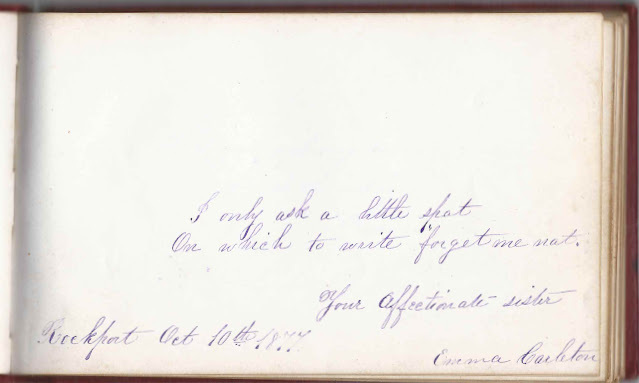 William D. Carleton, signed at Rockport, Maine, on October 10, 1877; "your Brother". He was William Dexter Carleton, born 1 October 1839, son of Samuel Dexter Carleton and his first wife Caroline T. (Ulmer) Carleton. William's wife, Emma J. (McLane) Carleton, signed the right facing page. 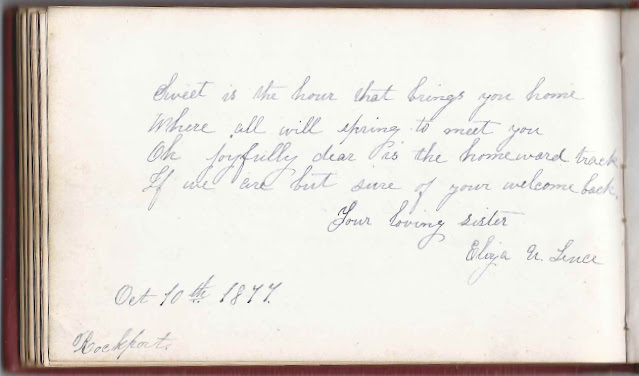 Emma Carleton, signed at Rockport, Maine, on October 10, 1877; "Your affectionate sister". She was the wife of William Dexter Carleton, who signed the left facing page, and thus Adelia's sister-in-law. I found conflicting sources for her parents. Some say James and Hannah McLane. Her death record gives Leonard and Mary (Shaw) Stevens. Harriet N. Carleton, "your affectionate Mother". She was Harriet Newell (Washburn) Carleton, Adelia's stepmother. Elias Christian, Age 36 Years. Elias Christian was born in 1845 at Pitcairn Island, son of Thursday October Christian II and Mary Polly Young. Thursday October Christian. [He was Thursday October Christian II, grandson of Fletcher Christian. He was born in October 1820 at Pitcairn Island. 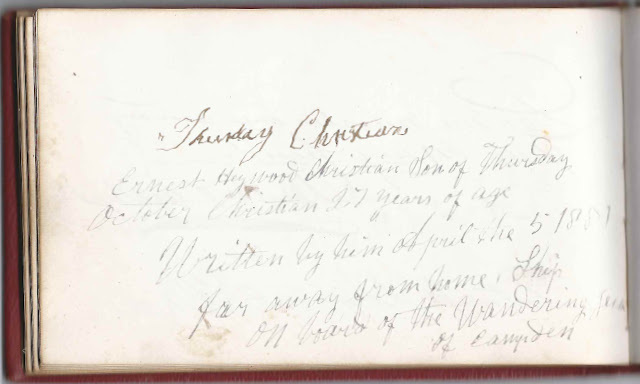 He shared the page with his son Ernest Heywood Christian. Ernest Heywood Christian, Son of Thursday October Christian, 27 years of age. Written by him April the 5, 1881 far away from home. Ship on board of the Wandering Jew of Camden" [Maine]. Adelia's father Samuel Dexter Carleton was one of the owners of this ship. Ernest Heyward Christian was born 5 October 1853 at Pitcairn Island, son of Thursday October Christian II and Mary Polly (Young) Christian. Ella W. Clark of Winchester, Massachusetts, signed on the "Wandering Jew", which she sailed from October 24, 1882 until August 9, 1883. I believe this is the ship built at Camden, Maine in 1877, about 219 feet long, with a 40 foot beam, 29 feet deep, weight of 1650 tons. One of her owners was Adelia's father Samuel Dexter Carleton. She was scuttled at Hong Kong in 1895 after catching fire. C. Eugene Cobb of Camden, Maine, signed at Shanghai, China, on November 2, 1873. Presumably Charles Eugene Cobb, born about 1845, son of George and Betsey (Parker) Cobb. Sadly, Charles Eugene Cobb died at Shanghai, China, just over a year after he signed a page in Adelia's album, on 25 November 1874. Charles E. Cooley of Boston Highlands, signed on August 27, 1876. His wife signed the right facing page. I found two instances of a Charles E. Cooley at Boston; sadly, his wife didn't sign with her own name to differentiate. Mrs. Charles E. Cooley of Boston Highlands, signed on August 28, 1876. Her husband signed the left facing page. I found two instances of a Charles E. Cooley in Boston; sadly, Mrs. Cooley didn't give her own name, which would have helped to differentiate. G. Howe Davis, signed at Boston, Massachusetts, on Christmas Day 1874. He was George Howe Davis, born in 1836, son of George and Nancy (Howe) Davis, and a bank cashier at Boston. His wife, Alexandrina P. (Gerry) Davis, signed the right facing page. Mrs. G. Howe Davis, signed at Boston, Massachusetts, on December 18, 1874. She was Alexandrina P. (Gerry) Davis, daughter of William and Lucy Gerry, and wife of George Howe Davis, who signed the left facing page. 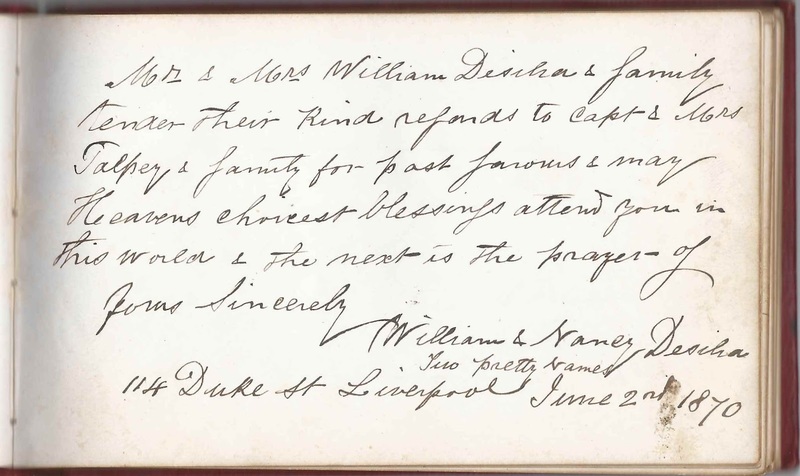 William & Nancy Desilva, 114 Duke Street, Liverpool, England, signed on June 2, 1870. Presumably the William Desilva who produced sextants and other devices. Nancy was Nancy (Willey) DeSilva, born at Thomaston, Maine, daughter of, I think, John and Nancy (Thompson) Willey. Joseph Willey DeSilva, signed at Liverpool on March 27, 1870. Son of signer William Desilva, a native of Liverpool, England, and a noted sextant maker, and his wife Nancy (Willey), who was born at Thomaston, Maine. H. F. Doane of No. 11 Hamilton Street, Cambridge Port, Massachusetts, signed at Liverpool, England, on June 2, 1870. Hannah F. (Snow) Doane, born 6 October 1840 at Orleans, Massachusetts, daughter of Russell and Hannah Snow (Sparrow) Snow, and wife of Sea Captain Alfred Doane, who signed the right facing page. Ruth C. Eells of Camden, Maine, signed on February 13, 1877. Daughter of Captain Edward Lenthal Eells and Jane W. (Fuller) Eells. Damon W. Fales, signed at Rockport, Maine, on September 6, 1877; "your loving Cousin". His mother, Antoinette (Washburn) Fales, was a sister to Adelia's stepmother, Harriet Newell (Washburn) Carleton. Damon's father, Lewis T. Fales, was also from Maine. Flora M. Freeman. She was Flora M. (Talpey) Freeman, Adelia's stepdaughter, daughter of Henry Talpey and his first wife Mary Elizabeth (Stover) Talpey, and wife of George A. Freeman. Joshua Freeman of Brewster, Massachusetts, signed at Liverpool, England, on May 31, 1870. His wife Lucy (Lincoln) Freeman signed the right facing page. He was Sea Captain Joshua Freeman, Jr., born 10 July 1835 at Brewster, Massachusetts. Among the ships he commanded: "Christopher Hall," "W. B. Dinsmore," "Gold Hunter " and "Glory of the Seas." Lucy A. Freeman of Brewster, Massachusetts, signed at Liverpool, England, on May 31, 1870. She was Lucy A. (Lincoln) Freeman, daughter of Charles and Mercy Lincoln, and wife of Sea Captain Joshua Freeman, Jr., who signed the left facing page. George A. Freeman, signed at Liverpool, England, on March 27, 1870. He was the husband of Adelia's step-daughter, Flora M. Tapley, daughter of Henry and first wife Mary Elizabeth (Stover) Tapley. Flora signed the right facing page. See a reader's comment. Flora M. Freeman. Her husband George A. Freeman signed the left facing page. Flora, Adelia's stepdaughter, was the daughter of Henry Talpey and his first wife Mary Elizabeth (Stover) Talpey. See a reader's comment.
? T. Lewis, signed at Antwerp, Belgium, on December 24, 1877, on the Ship Lathley Rich". Apparently he met Adelia while they were staying at the Hotel Des Flanders, and she was on the "Wandering Jew", owned partly by her father. I believe this is the ship built at Camden, Maine in 1877, about 219 feet long, with a 40 foot beam, 29 feet deep, weight of 1650 tons. She was scuttled at Hong Kong in 1895 after catching fire. Eliza U. Luce, signed at Rockport, Maine, on October 10, 1877; "your loving sister". She was Elizabeth Ulmer (Carleton) Luce, full sister to Adelia and wife of William Henry Luce. William J. Martin, signed at ? 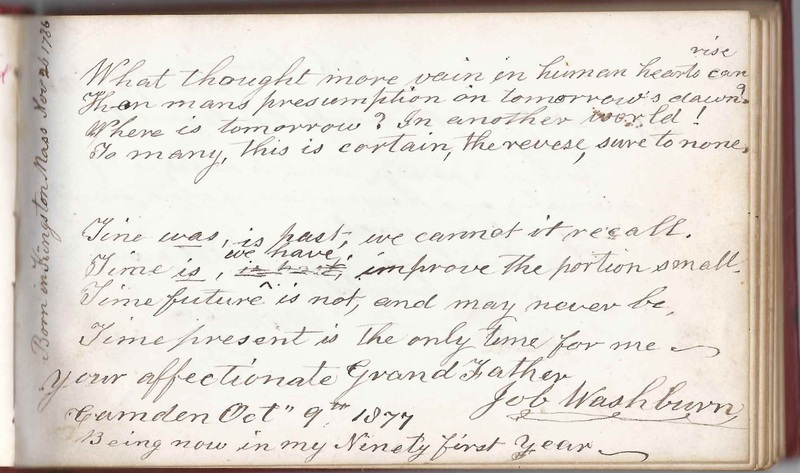 on December 23, 1877 [or 1871], ship "Eliza McNeal"
James Russell McCoy, signed at Pitcairn Island on February 23, 1880. He was born September 4, 1885 at Pitcairn Island, son of Matthew and Margaret (Christian) McCoy. He served many terms as Chief Magistrate. J. E. Pendleton of Searsport, Maine, signed at Hackney, [London, England] on August 1, 1870. Presumably Julia Elizabeth (Blanchard) Pendleton, whose husband Phineas Pendleton III signed the right facing page. Ph. Pendleton, 3rd of Searsport, Maine, signed at Hackney [ London, England] on 1 May 1870. Presumably Phineas Pendleton III, (1831-1909), son of Capt. Phineas and Wealthy (Carver) Pendleton. 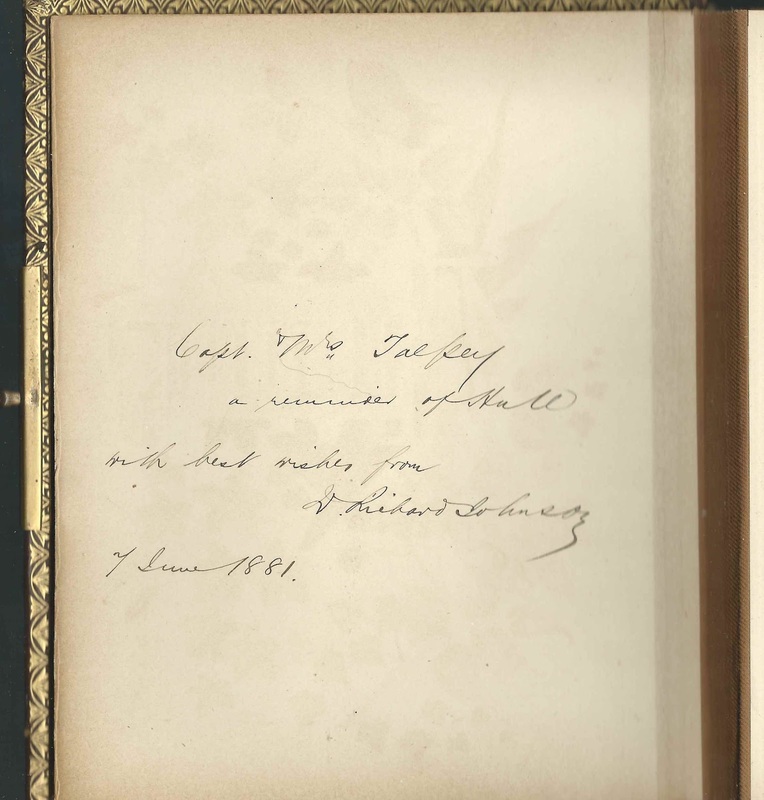 His wife Julia Elizabeth (Blanchard) Pendleton signed the left facing page. Capt. Frank I. Pendleton of Searsport, Maine, signed at Cardiff, Wales, on January 24, 1878. Presumably Frank Irving Pendleton, born 10 November 1848, son of James Hervey Pendleton and Esther Houston (Pendleton) Pendleton. A. H. Pinkham of Boston, Massachusetts, signed on September 20, 1872. His wife signed the right facing page. Mrs. A. H. Pinkham of Boston, Massachusetts, signed on September 23, 1871 [perhaps 1872, as that is the date her husband used when he signed the left facing page]. N. Pratt, signed at Shanghai, [could be China or, since it's in quotes, could be the name of his vessel, China or Chimera or ? ], on October 28, 1873. Presumably Sea Captain Nichols Pratt, born 23 September 1840 at Cohasset, Massachusetts, son of Nichols and Ruth (Snow) Pratt. His wife, Abbie Jane (Veazie) Pratt, signed the right facing page. Abbie V. Pratt of Belfast, Maine, signed at Shanghai, China, on October 12, 1873. She was born Abbie Jane Veazie at Belfast, Maine, on 7 February 1844, daughter of William and Charlotte (Hutchings) Veazie. 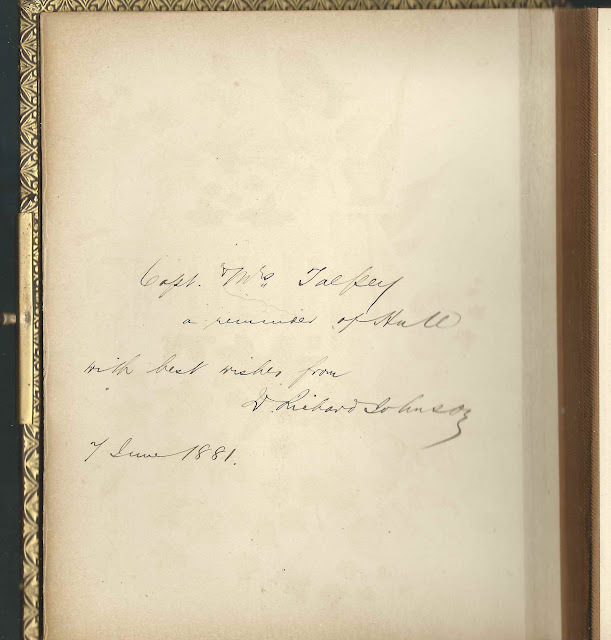 Her husband, master mariner Nichols Pratt signed the left facing page. Henry Talpey, Master, signed in the Pacific Ocean at Lat. 36 North, Long 137 West, Bound to San Francisco, signed August 26, 1869. He was the husband of Adelia Caroline (Carleton) Talpey, whom he had married on November 24 November 1868, his third wife. Constance Mary Beatrice Talpey, signed at Boston, Massachusetts, on November 1, 1897. She was Constance Mary Beatrice (Fryer) Talpey, the wife of Alfred Henry Talpey [who also signed a page in the album], Henry Talpey's son from his first marriage to Mary Elizabeth (Stover) Talpey. Florence Trafton Talpey, daughter of Constance Mary Beatrice (Fryer) and Alfred Henry Talpey, would marry writer Ben Ames Williams. A. H. Talpey, signed at Liverpool, England, on March 27, 1870. I believe this was Adelia's stepson Albert Henry Talpey, son of Henry and his first wife Mary Elizabeth (Stover) Talpey. Albert Henry Talpey's wife, Constance Mary Beatrice (Fryer) also signed a page in the album. Annie C. Talpey of Cape Neddick, Maine, signed on September 2, 1870. She may have been the daughter or niece of Josiah Talpey who was a brother to Adelia's husband Henry Talpey. Nell Tobey of Thomaston, Maine, signed at Liverpool, England, on April 25, 1870. 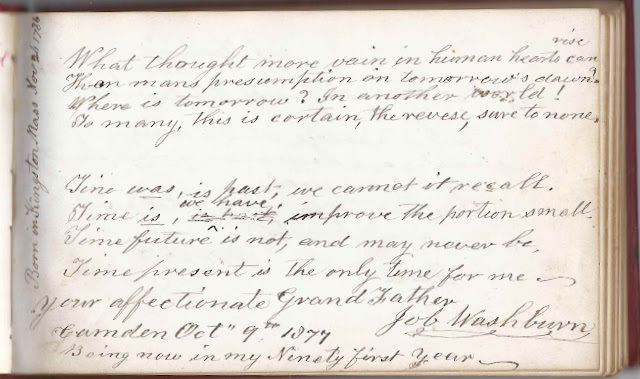 Job Washburn, signed at Camden, Maine, on October 9, 1877, "Being now in my Ninety first year". He was Rev. Job Washburn, father of Adelia's father's second wife Harriet Newell (Washburn) Carleton. Rev. Washburn performed the service at the marriage of Adelia and Henry Talpey in November 1868. Dexter Carleton Washburn of Lewiston, Maine, signed at Rockport, Maine, on August 15, 1877; "your nephew". His mother, Sarah Jane (Verrill) Washburn was Adelia's older half-sister. His father, William H. Washburn was a brother to Adelia's stepmother, Harriet Newell (Washburn) Carleton. S. J. Washburn of Lewiston, Maine, signed at Rockport, Maine, on August 22, 1879; Adelia's sister. She was Sarah Josephine (Verrill) Washburn, daughter of Adelia's mother Catherine T. Ulmer and her first husband William Verrill. Sarah married Rev. William H. Washburn, also a signer in the album, as was their son Dexter Carleton Washburn. William H. Washburn of Lewiston, Maine, signed on August 22, 1879. William H. Washburn was the husband of Adelia's maternal half sister Sarah Josephine (Verrill) Washburn. Sarah and their son Dexter Carleton Washburn also signed pages in the album. He was a brother to Adelia's step mother Harriet Newell (Washburn) Carleton. 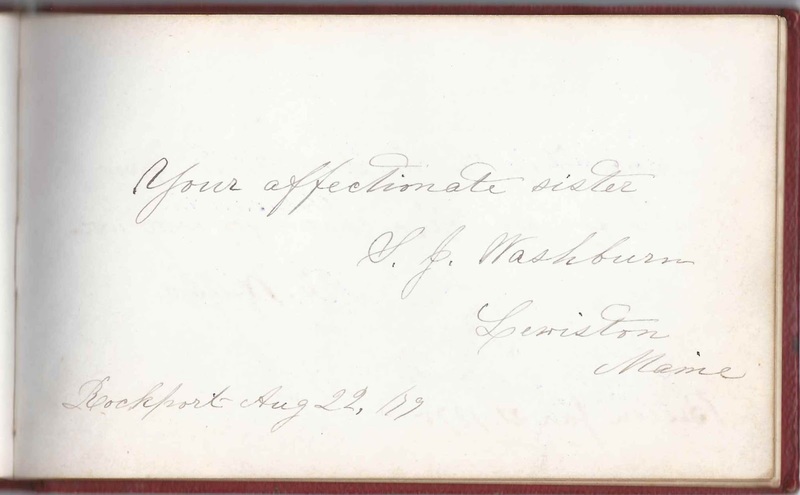 I. L. Washburn, or S. L. Washburn, signed at Camden, Maine, on October 8, 1877.
? Willard, signed at Boston, Massachusetts, on January 21, 1875. Initial might be T or E or ? Simon Young, signed at Pitcairn Island, on February 23, 1880. Simon was born in 1823 at Pitcairn Island, son of George and Hannah (Adams) Young, and husband of Mary Buffett Christian Young. B. Stanley Young, 29 years; presumably signed at Pitcairn Island. Benjamin Stanley Young, born 1851 at Pitcairn Island, son of Simon Young and Mary Buffett Christian Young. Charles Carleton Vieder Young, who signed as "Hugh Carlton, The first music teacher on Pitcairn Island". Charles Carleton Vieder Young was born in 1850 at Pitcairn Island, the son of Moses Young and Albina (McCoy) Young. George E. Selwyn, Aged 23 years. I believe he was George Edwin Selwyn Young, born at Norfolk Island, son of signers Simon Young and Mary Buffett Christian Young. "Among the 2nd wave of returnees from Norfolk to Pitcairn in 1864. He died in the typhus epidemic." Miss Maria Jane Young, signed on February 23, 1880. She was born in 1862 at Pitcairn Island, the daughter of William Mayhew Young and Margaret (Christian) Young. Mary A. Young, signed on February 23, 1880, at Pitcairn Island. Presumably Mary Ann Young, born in 1855 at Pitcairn Island, daughter of Simon and Mary Buffett Christian Young. Mrs. Mary Young of Pitcairns Island, signed on February 23, 1880. Presumably Mary (Evans) Young, born in 1833 at Pitcairn Island, daughter of John and Rachel (Adams) Evans and wife of George Martin Frederick Young. My great-great grandfather was Capt. Martin Francis Patterson. 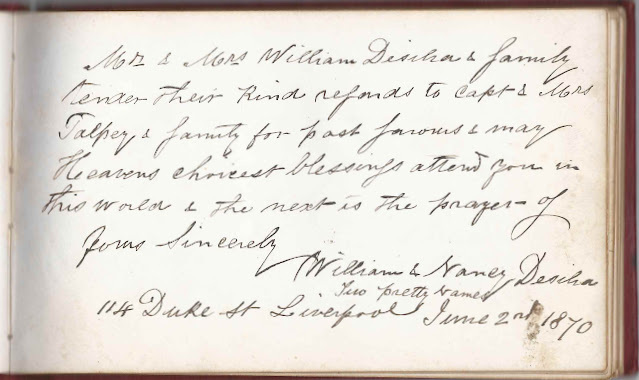 His wife was Ellen Jane (to fill in initials on both) I have 3 of his Maritime diaries from Shanghai 1873, 1879, 1899. All mention names in the album. Looking for the rest of diaries. Janet, please contact me so that I can send you a scan of the two pages. Thanks for that wonderful information - those diaries must be great reading. Good luck on your quest to find the others. Found this page when researching George A. Freeman and Flora Talpey. Their son, Dexter Freeman was my elderly neighbor when I was a kid. Thanks, Auntie Em! I amended the post to direct readers to your comment.